Formerly a family residence and lovingly developed into a boutique hotel, dotted with arts and crafts and Indonesian antiquities, this adults only (12 years and above) gem of a hotel offers an infinity pool right by the beach with a cocktail pool bar to celebrate the sunset and lively evening entertainment in the restaurant. 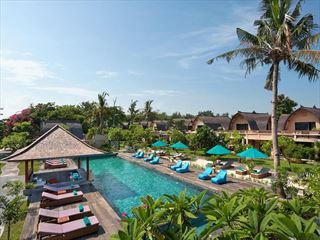 Puri Mas is made up of two resorts - the beach resort, where your accommodation is located with an infinity pool looking out to sea, plus a second estate (5 minutes’ drive inland) the beautiful spa resort. Guests can enjoy complimentary car transfers between the two as required and you can choose to take your breakfast at the spa, or treat yourself to lunch in the amazing gardens where a welcoming pool awaits in a unique jungle-like setting, designed to fully calm the mind and rejuvenate the body - the massage treatments here are truly relaxing and unwinding. 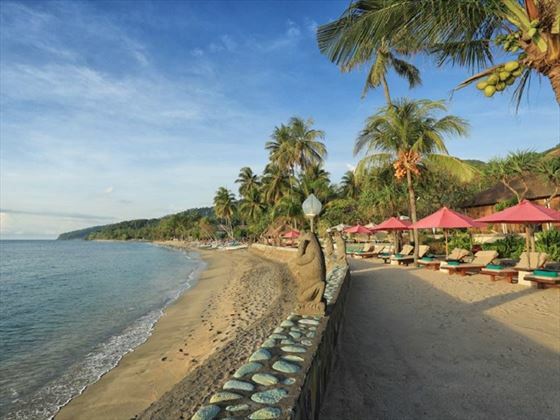 3km from Sengiggi, the tourist hub of Lombok with are cafes, restaurants, local vendors and nightlife – you are close enough to easily dip in but far enough away for a tranquil stay with great ambience. Lombok has its own airport which you can fly into from Bali in 25 minutes with an airport transfer of 90 minutes by road. Alternatively, take a speedboat early morning from Bali (approximately 2.5 hours), land at the port on Lombok, with an hour transfer to the hotel. You are on the north coast of Lombok, so a day trip to the Gili islands for snorkelling is easily arranged. It is 2 hours north to Mount Rinjani and the waterfalls of the national park. Quirky Garden - On both the ground and first floors with plenty of character, antiques and local flavour in the rooms with 40sqm of space and garden views from the terrace. Most have an outdoor bathroom for a shower under the stars, although an indoor bathroom can be requested (not guaranteed). Classic Queen Rooms - Classic refers to the style of building; freestanding traditional Indonesian cottages with 56sqm of space within a lovely garden and partial ocean views. Intimate garden bathrooms with reainforest showers with or without bathtubs. Romantic draped four poster beds and a large terrace with daybed. Royal Suite Ocean Views 70sqm on the first floor where floor to ceiling folding doors open up to a views over the resort’s pool and out to the ocean. They are fitted out with an antique four poster bed, sitting area to admire the sunset and an elegant spacious indoor bathroom with a large separate rain shower and bathtub. 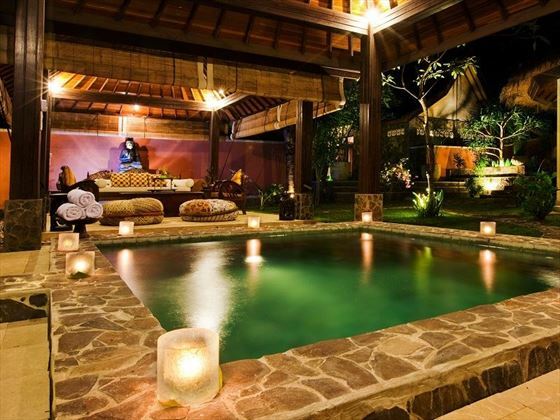 Jacuzzi Villa - Enter through wooden doors into a dainty garden with a terrace and plunge pool perfect for two. The traditional 66sqm style bedroom comes with a king size bed on the cool marble floor and glasss doors leading into your bathroom with a rain shower and bathtub. One Bedroom Romantic Pool Villa - 91sqm with king size beds with romantic curtains and sliding doors out onto the terrace and pool area. The garden bathroom offers a rain shower and delightful bathtub under its own pavillion. *Some with indoor bathrooms and round tubs cosy enough for two. 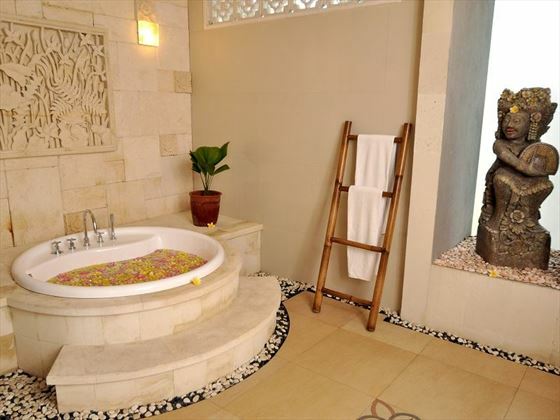 Set among a hectare of beautiful tropical gardens, Puri Mas Spa uses the finest products for your face, body, hands & feet. You will be welcomed to the Spa and permitted to leave your worries behind, embracing your sense of wellbeing and enjoying the traditional Indonesian Charm that is valued as a visitor to Indonesia. You can enjoy dining at the main resort for breakfast, lunch and dinner at the Rijisttafel - an ancient style of eating brought to Indonesia from the Dutch Colonial Era located on the beachfront terrace. 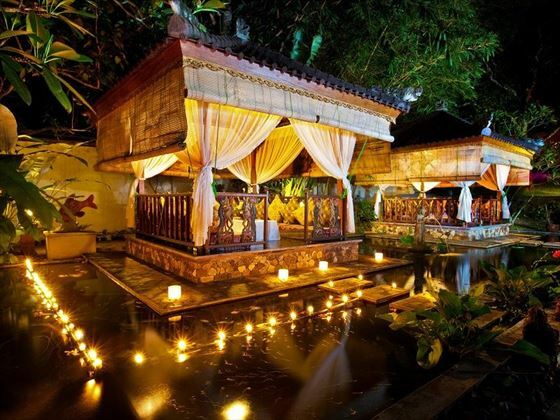 You can enjoy a romantic dinner from your private terrace, Javanese floating Pavilions, poolside or the beautiful Joglo House or Balinese Bale. Please note there is currently construction taking place at the Spa Resort while they re-build after the earthquake in August 2018. This does not affect the main resort. 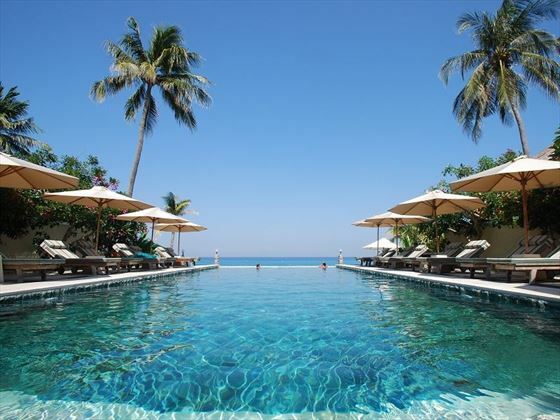 The resort has converted one of their beautiful villas into the Spa and it is looking spectacular right now, treatments will be held at the main resort with a sea view. The Spa Resort is due to re-open end of May 2019. 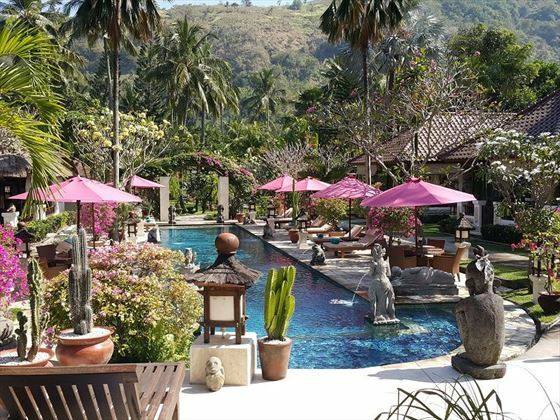 Villa Ombak is wonderfully located on a private beach within walking distance of the art market and local restaurants around lively Gili T Harbour.